A few months later, Reynolds took a trip to Target looking for a book on Martin Luther King, Jr. for her young daughters. Instead, the media often portrays Black boys and men as angry, criminal, and dangerous. Reynolds noted how the ramifications of these biases manifest in police brutality and mass incarceration. “Black men are suffering the consequences of death, from people having this fear that’s created for them by media outlets,” Reynolds said. There are countless examples: in the case of seventeen-year-old Trayvon Martin, George Zimmerman justified shooting Martin because his description—essentially, a tall Black male—fit that of burglars who had apparently recently hit a few of the homes in his neighborhood. Reynolds decided to do something about it. She is now working on a children’s picture book showcasing the joy she knows and loves in little Black boys. 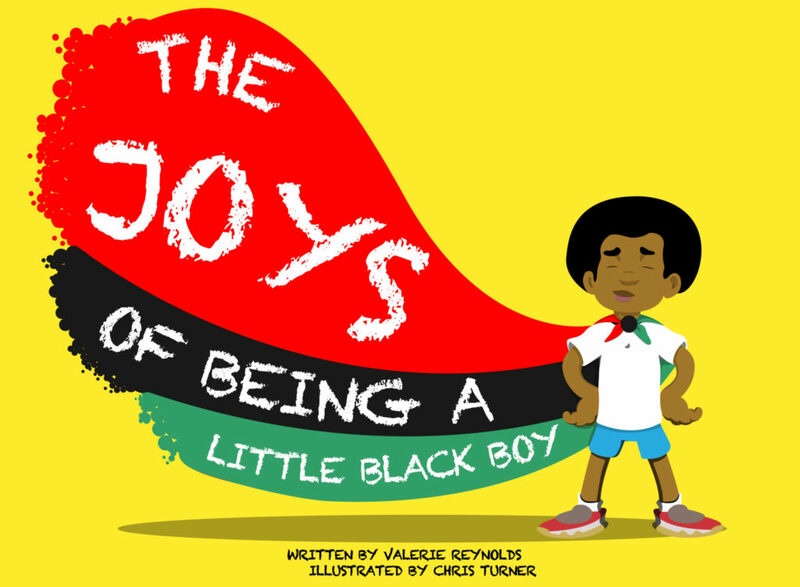 Through The Joys of Being a Little Black Boy, which will be available in late September in schools and bookstores across the country, Valerie hopes to educate and empower Black boys and men against negative media stereotypes. “In the South Side, it’s just families—it’s families who are working every day, sending their kids to school, and raising their kids in the same way as families on the North Side of Chicago, in Wisconsin, or in Ohio. It’s very similar, but the media conveys it [differently],” Reynolds said. One of these joyful boys that Reynolds has seen grow up is the book’s illustrator, Chris Turner. The two have known each other since Turner was born, which wasn’t all that long ago—Turner is now nineteen. Reynolds approached Turner, whom she refers to as an “extended family member,” about doing the project’s artwork when he was seventeen. The book centers on the main character, Roy, and opens in a class assembly. “He takes his classmates on what we call a journey of joy in Black men,” Reynolds said. Roy encounters and interacts with a variety of Black historical figures throughout the story; with each encounter, he learns more about African-American history and the amazing past of the people who came before him. “It’s sort of reminding his classmates that all these men we marvel at now as Black men were once Black boys,” Reynolds said. Reynolds took a unique route to publication, choosing to fund the book’s printing and distribution through a Kickstarter that people from around the country could donate to. “We figured this would be a really good platform for us to raise money to publish the book and to create a market name and buzz before the book actually hits retailers,” Reynolds said. She published with the help of Hurston Media Group, a boutique consulting firm focused on “urban” millennials. “Black boy joy is something that every boy, every Black boy has,” Turner said. For Turner, “Black boy joy” involves overcoming the obstacles put in the way of Black boys and men throughout their lives. “The way to continue to do that is to do it with joy, and just to keep being happy and making sure that the people that slow you down don’t get the better of you,” he said. Turner hopes that the book can really hit home for Black boys just like him, and that it will further the conversation that empowers little Black boys to dream big. Valerie Reynolds, The Joys of Being a Little Black Boy. Illustrated by Chris Turner. Hurston Media Group. Available September 2017. Outstanding article, its insightful enlightening, educational and very much true. It shows that African-American boys aren’t one dimensional.